While people are focused on President Trump, day-by-day, with little notice, the Koch Brothers are getting stronger. And their deep ties to Vice President Mike Pence are paying off. David Koch has demonstrated his appreciation of Pence by giving him more money than to any other candidate. Today, Pence is one step away from becoming President of the United States. When he recommends individuals for major jobs in the Trump Administration, as he did consistently as the leader of the transition, and to this day in his role as Vice President, Pence guides implementation of the Koch agenda. 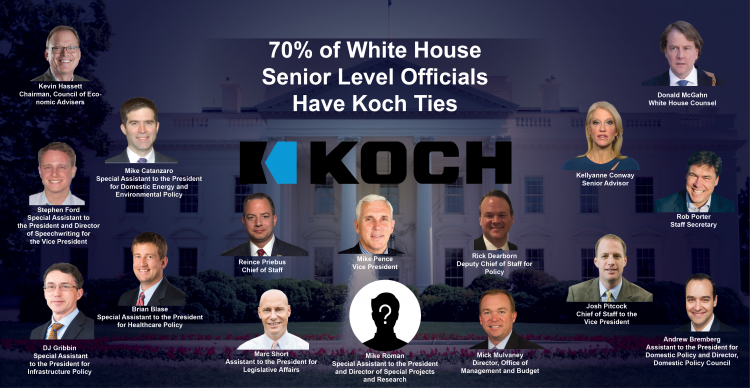 Over 18 months, Checks and Balances Project conducted the first in-depth investigation into both Koch Industries, Inc. and what we call the Koch Advocacy Network. Although it is not characterized as a major producer of oil, Koch Industries participates in industrial processes that transform raw fossil fuels into usable goods. The bottom line: Koch Industries acts continuously to protect and grow the business and the Koch Advocacy Network – made up of groups like Americans for Prosperity, Freedom Partners Chamber of Commerce, and dozens of others – is designed to protect and grow Koch Industries. Marc Short, Assistant to the President for Legislative Affairs: Short is best known for his tenure as president of the Koch Brothers’ Freedom Partners Chamber of Commerce, the political fund organized by the Koch Brothers to advance their far-right, pro-corporate, antienvironmental agenda. He was also Koch Industries VP of Special Projects. Don McGahn, White House Counsel: While a partner at Jones Day, McGahn was a lead lawyer for Freedom Partners Chamber of Commerce before joining the Trump campaign. Founded in 2011, the board of Freedom Partners Chamber of Commerce exemplifies the intertwined relationship between the Koch corporate and Koch Advocacy networks. Its board is composed of current and former Koch Industries executives and trusted Koch allies. Mike Roman, Special Assistant to the President and Director of Special Projects and Research: A longtime Republican opposition researcher who worked for billionaire brothers Charles and David Koch before joining the Trump campaign. Stephen Ford, Special Assistant to the President and Director of Speechwriting for the Vice President: Formerly Charles Koch’s writer, Stephen Ford is now Vice President Mike Pence’s speechwriter. To learn more about the 23 White House senior officials, click HERE or on the image at the top.